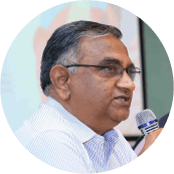 Dr. Kakarala is a Professor at the School of Policy and Governance, Azim Premji University. He did his Masters in Political Philosophy (Madras University), LLM in Human Rights Law (University of Nottingham, UK) and Ph.D in Political Science from the Centre for Social Studies, South Gujarat University, Surat, India. He was Vice Chancellor, Glocal University, Uttar Pradesh and prior to that, he was a Professor at the Centre for Culture and Society and at the National Law School of India, Bangalore. His areas of research are Socio-legal and political theory, law and culture, human rights law, comparative law and comparative constitutionalism.